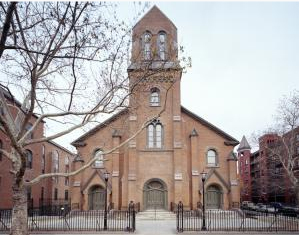 HQ served as New York City Landmarks Preservation Commission consultant to Triangle Equities and architects Robert Scarano Architects for the residential conversion of the former St. Peter’s Church complex on Hicks Street in Brooklyn’s Cobble Hill neighborhood. The project included the design of an infill connector building and a separate rear addition to the St. Peter’s Academy building, and the restoration of three historic buildings, for which HQ prepared restoration recommendations and provided field review. The historic church, rectory and academy were rehabilitated for residential use. This project was completed in 2005.